The department is equipped with modern laboratories to impart technical know how with state of art technology and infrastructure. 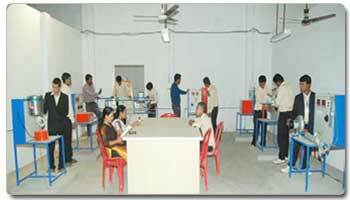 It is backed by highly qualified faculty and lad demonstrators/ technicians. MACHINE SHOP- comprises of centre lathe, shaper, plain milling machine,pillar and sensitive drilling machine, surface grinding machine ,capstan lathe, reciprocating saw are installed in the machine shop. Fabrication shop- comprises of electric arc welding machine, oxyacetylene gas welding and gas cutting set with all the accessories are available in the fabrication shop. MIG welding set is also available. Material testing lab- equipped with universal testing machine, hardness testing machine impact testing and fatigue testing facilities are available, which are handled by an experienced lab technician. Fluid machinery lab- equipped withclosed circuit vertical type Kaplan turbine, Francis turbine and computerized dataacquisition for Pelton turbine coupled with eddy current dynamometer facilities are available. 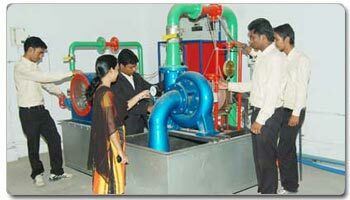 Hydraulic lab- comprises of meta centric height apparatus test, reciprocating pump test rig,impact jet test rig, centrifugal pump test rig , impact of jet ,Bernouli’s apparatus in very good working condition. 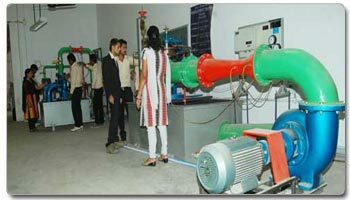 I c engine lab- load test facilities of diesel and petrol engine of two stroke and four stroke , modern carburetor, cooling and lubricating system are available in the lab. Machines dynamic lab- equipped with the experiments on rope/ band brake dynamometer, epicyclic gear train, spring loaded governor, static and dynamic apparatus, gyroscopic, critical speed of whirling shaft apparatus . Heat transfer lab- comprises of determination of thermal conductivity of composite slab, heat transfer co efficient in natural and forced convention surface emissivity heat exchanger performance test of both parallel and counter flow. Efficiency and effectiveness of fins, and verification of Stefan Boltzman’s law. Numerical computation and solid modeling lab- equipped with auto cad solid works adMATLAB facility in an air conditioned lab facilitated by experienced faculties. Engineering drawing lab- in an air conditioned lab with 40 drawing boards with all accessories are available for designing and drawing of machine components. Heat power lab- for the study and analysis of performance of reciprocating air compressor steam power plant, turbine power plant and power transmissionsystem of automobiles are available. Cut models – to study and know the performance of the machine components various cut models like-4 stroke single cylinder, 2 stroke single cylinder petrol engine and other cut section models are available. Automobile lab- one petrol engine MARUTI 800model is available to study and dismantling and assembly of various components of an assembly and get conversant with the major components/ parts. To set up a CNC Machine shop to get students acquainted with the latest manufacturing processes. This project is in the process and will be commissioned soon. Lab Equipment - For the refrigeration and air conditioningand metrology lab equipped and metrology lab equipped with latest measuring instruments and gauges used in modern plant are expected to be installed very soon. Non conventional source of energy like solar energy plant is in the process of installation in the campus for allowing the students to get exposure all about it and can undergo various projects concerning to it. Seminar/ workshop- plan to organize seminar / workshop on a regular basis by taking assistance from the consultant on a regular basis to be scheduled every fortnightly from 7th semester onwards. Training and placement - we organize various programmes related to personality development of students and hire consultant./HR personnel from the industry to get exposure to our students all about the present requirement of modern industries. Industrial visit – plan to organize visit to the industry like steel plant, modern power plant (FBC Boiler) ,manufacturing plant, automobile plant on monthly basis to get the students acquainted with the workings of the modern industries. Project work-- students are encouraged to take up the project for the award of B Tech in engineering in industries so that they can hone the technical competency working with the industry technicians and suggest the remedial solutions of critical problems faced by various industries. Latest technology- to get exposure to new techniques in the field of iron making, steel making , manufacturing students are exposed to the new concepts like TPM, six sigma etc.